“Then, why do you write about your mom and not your dad?” my son asked recently during one of our occasional reflective conversations. Our original discussion had gone off on a tangent, as often happens late at night and/or when he has an impending homework assignment. This tangent involved an analysis of parent/child relationships and how I had a close and loving relationship with my dad. Stumped, at first, to find the right response, I gave the very typical, “Good question” and then proceeded with an answer that I knew I would expand upon in this blog. After all, I only once focused completely on my dad a few years ago when I wrote about him on his birthday. And, today, his Yarzeit, the 26th anniversary of his death, is certainly a good day to celebrate the time that I did have with him and the relationship that, I’m sure, we each treasured. As I explained to my son, I think that the innate female bond that I had with my mom also created typical and maybe even exaggerated tensions. And, I imagine, that the same might be true with dads and their sons if it’s a gender thing. So, naturally, there were times I felt more support, praise and “material gain” from my dad. It was easy to please him. My mom was a prolific and expert cook. And, since my dad could not even boil an egg, making him the simplest sandwich resulted in great gratitude. I remember standing in the pre-teen department of East Brunswick’s Bambergers begging my mom for a white and pink sweater that I, of course, thought would change my life. She said she had reached her spending limit, but, to avoid my potential terrible tantrum, she agreed to call my dad. Using the salesperson’s counter phone, she attempted to confirm the purchase denial, but was told to let me have this one additional item. It was much more than this. My dad was the instigator of Sunday “I don’t know where we are going” drives. He would love to take us on short mystery drives. And, he was the one who announced one year just before Christmas, “We’re going to Florida next week. Be packed and ready for the drive.” I look back on photos and memories of my college graduation and I can guarantee that my dad’s smile was bigger than anyone else’s. I am sure if I wanted to, I could write about the bad times. Neither of my parents were close to the perfection I sometimes describe. The truth behind my blog is the feelings I am left with. For me, this pollyana-esque journal is more natural and satisfying. I am lucky to have the whispers of both my father and my mother. My mom certainly never intended to raise an Olympian and neither did these moms! They did what most of us moms want to do: they helped their children make the most of their talents and skills. Well, then, of course, one thing led to another and there they are in London! Actually, I made it to London too (for college study abroad in 1985) and I do have my mom and her sister (one of my dearest “other mothers”) as well as my dad and uncle to thank for that. The fifteen minutes I spent watching these videos provided some of the best parental advice. I only hope to be affected by the moms’ recollection of their goals and parenting styles. Kerri Walsh-Jennings’ mom takes more pride in the “wonderful human being” her daughter is than in her athletic accomplishments. She helped her daughter dream big and play to win, but also helped give her stability and balance. The British runner, Jessica Ennis is lucky to have a mom who saw her desire to compete and helped nurture that desire. It sounds like Paula Findlay’s mom’s glass was half full. She put a positive spin on the tough times while giving her daughter “freedom to flourish.” Ryan Lochte’s message hit me the hardest. While his mom helped him persevere, he also felt that “If she had a tighter leash…I might have hated it (swimming).” I am already hearing him as I want to tell my son or daughter what to do next…. Not all moms can or should raise an Olympian. And, certainly many Olympians and world-class athletes come from broken and dysfunctional homes. I have written about the risks my mother encouraged me to take, the lessons I learned from her, and the many interests and skills I have because of her. I credit both of my parents with allowing me independence and fostering self-esteem and my desire to achieve my goals. They were proud of my accomplishments as long as I strove for the gold medal in whatever I chose to pursue. I hope you will watch some of these videos that inspire gold medal mothering and I would love for you to comment on your favorites. While writing this blog helps me celebrate the relationship I did have and think about the relationship I could have with my mom, I often get a pang of guilt for not writing about my dad. He passed away six years before my mom and was always a HUGE and WONDERFUL part of my life. I had a great relationship with my dad. In fact, I often credit him with some of the most important factors that have shaped me. 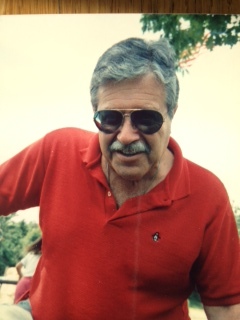 Today is my dad’s birthday and he would have turned 82. While he was obstinate and strict and did not lavish me with things, I always felt loved and secure, without judgment or measurement. It was easier to please my dad than my mom. All I had to do was try my hardest and keep safe. When I came home from my freshman year in college and announced that I wanted to change my major and career goal from economics (and either business or law) to English and teaching, I feared I would disappoint him. Wow, was I wrong. He was thrilled that I had found a passion and profession. He was quirky, but I don’t remember being embarrassed. He had a CB Radio and handle, Bold Eagle, and spent hours on it, at home and in the car. As soon as the Commodore 64 computer came out, he bought one and spent hours on that. He was a Brooklyn native and New Jersey resident, yet wore Stetson cowboy boots and hats. He drove me anywhere I needed to go and, I think, tried to say yes when he could. Yet, it was not all perfect. I remember when he was angry that I drove his car to work in an ice storm. At the time I thought (and I’m still not sure) that he was more worried about his new car than me. He was a cosmetics company executive, but told me I looked like a call girl when I put on too much blush (ok, so I was young, only 12 and used a ton of gel rouge). Yet, he was responsible for teaching me so many life lessons during those crucial moments, like when I broke our first and only color TV, broke into our house because I forgot my key, or had to re-write an English essay he thought was horrible. I could go on and on. I miss him as much as I miss my mom. Yet, there is a certain tie that I have with my mom and that I yearn for as a woman and mother. So, especially today, and actually always, I wish my mom and I wish my dad…. What differences do you recall in how your parents handled important moments in your life? Even if you were “daddy’s little girl,” do you find the mother/daughter bond to be even more crucial? What are the differences in a mother’s and father’s influence in our adult lives?